My (US) Representative, Republican John Sweeney, showed up at a frat party recently at Union College. The students claim Sweeney was drunk at the party, but Sweeney's friend says he wasn't. I say, "What on Earth was Sweeney thinking"? From reading the Times Union's article it appears that Sweeney hasn't even acknowledged that he showed poor judgment going to a frat party. Yet I'm sure he knows he shouldn't have gone to a frat party. There's obviously something about people in positions of power that makes them want to do things they know they shouldn't do. I've been in Europe for nearly 15 years and I never knew how to wave properly until now, thanks to the World Citizenship Guide, which was jointly produced by the US Government and a business group. In most European countries, the correct way to wave hello and good-bye is palm out, hand and arm stationary, fingers wagging up and down. Common American waving means no  except in Greece, where it is an insult. The idea is to help Americans behave better abroad. Here's tip number two: Smile. Genuinely.  couldn't be simpler. I wish I'd known that before now. Or, here's another one: Be quiet.  I doubt I could have done that even if I'd known it was a good idea. Wow! So much to learn. And, I haven't even seen the full guide. The abridged version is all that's available online. I have to go now, but I'll be practicing my waving the rest of the day. I really like this graph (found through NRO).Basically President Bush's poll numbers seem to follow the inverse of gas prices almost exactly. While the rights and wrongs of the war may be a difficult issue to gauge, gas at $3 a gallon is all bad. In Britain they're paying around $6.40 for a gallon. (It's around $5 a gallon here). Bush would be impeached long before the price got anywhere near that level. I know the ideas here are supposed to be "radical", but this article by Melanie Reid is just plain stupid. Her big idea? Get rid of Scotland's castle ruins. Having just come back from a tour of Scottish castles I'm probably more annoyed than I would normally be otherwise, but the castles I saw were both interesting and attractive. Why would anyone want to get rid of them? No-one cares if a pile was once the ill-built folly of some tasteless brewery magnate, who hired the eighteenth-century equivalent of Colin and Justin to build buttresses and turrets and create something of absolutely zilch architectural merit (and even less historical worth) which, thankfully, fell down some 150 years later when the family had drunk away its fortune. Because ruins are now business opportunities. Those same mountains of hubris are now A-listed, talked about in hushed tones and protected by Historic Scotland. The heritage trail wends its way to their doors. They feature on tea-towels, boast tea shoppes dishing up instant coffee and dry scones, and provide a decent living for the pipers who play on the ramparts on high days and holidays. I mean, have you been to Urquhart Castle on Loch Ness on a hot day in August? I didn't make it to Urquhart Castle, but how could anyone want to get rid of it? And, 18th century? All the castles I was at were 450 years old or more. I don't know. Maybe she was only joking. I was watching last night's Villareal vs Arsenal game on TV3 and I was marveling at the number of cliches used by the commentator (not the play-by-play man). In one 90 second stretch I think I counted more than a dozen cliches. Sheer genius. "They set their stall out early"  it's one that I never heard before I watched an English league soccer match. A nation of shopkeepers, indeed. He's giving 150%  when I was growing up 110% was sufficient, but since I've been able to get US sports on t.v. again I've noticed that for some announcers the ante has been upped. This is why the American economy is the most productive on Earth. 100% is insufficient. I'll have to think about this a little more. I'm sure there are dozens of others I could list. It's a no brainer really. 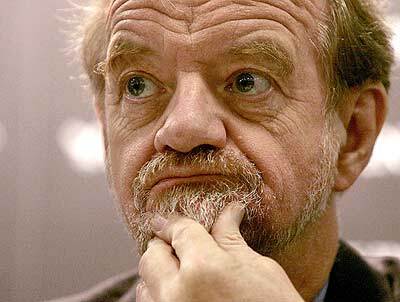 Where else would men who look like Robin Cook or John Prescott be attractive to women other than in positions of power? 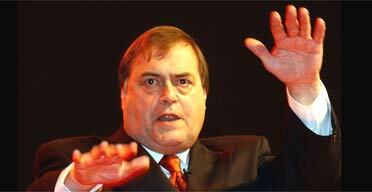 I have to admit I laughed when I heard that John Prescott had had an affair. It never rains . . . In my search for the missing archive data, I somehow managed to launch a malware attack on my PC. I don't know if this was when I was going through my cache looking for older versions of the file I accidentally deleted or when I was clicking on web pages that, if not for my desperation, I normally would be more likely to avoid (I suspect this is the answer). Regardless, this additional 'calamity' has meant that this page is being ignored again. I hope normal service can be resumed soon. I accidentally over-wrote a file the other day and lost all the Newshound links for April 1-15. I checked archive.org, but for some reason they stopped archiving my site in March 2005. If you know of another site that might have a copy of my site from April 15 or so, please let me know. UPDATE: Thanks to EWI for the google suggestion. I have now retrieved all the links through April 8. We were in Scotland again the past two days. Exhausted doesn't begin to cover it, but we had a good time. The trip was planned a while back, but Rosslyn Chapel was added after I read the Da Vinci Code. I half knew about this church before I read the book, but didn't really think about it. When I came across it in Brown's novel, I decided to google it and it sounded interesting and I wanted to see it. I thought the place was great, probably the highlight of the trip. One interesting fact about the church is that before the novel came out they averaged fewer than 10,000 visitors per year. Last year they had over 120,000 and they expect that figure to go even higher when the movie opens next month. Most of the trip was built around seeing castles around Stirling, including Stirling Castle. The weather was better than we expected, which made for a good trip. Bray has signed up to the "All Ireland Forum of Nuclear Free Authorities". I didn't know about this. This issue wasn't even discussed during the last election campaign. Well, that's it. I'm running for office next time on a Nukes for Bray ticket. I think I'll call my party the Braydioactive Party. For reasons that I really don't understand now looking back, until the first of April I never subscribed to mlb.com's online radio service. For $15 I get every single major league game (with a choice between listening to the home or away broadcast). I haven't missed a Met game yet. It's amazing how much I'm enjoying radio coverage again. When I was a kid I used to listen to loads of baseball before we got cable t.v. And, like a lot of people, I often say that I prefer baseball on the radio to television, but when given the choice I opt for the t.v. Yet, I can listen to baseball and get other things done at the same time. Watching a game rules out just about anything else, while listening to a game only engages half the mind and leaves the eyes free for other things. I think I am obliged by law to complete the census form, but do I have to tell the truth? To be honest, I'm not inclined to answer most of the questions. It's only four years since we did the last one and I am confident that the government knows enough about me already. He's not hitting yet, the whiff of steroids still swirls around him wherever he goes and now the Feds are taking aim at Barry Bonds. I can't understand how he's going to come out of all this - steroid accusations, possible perjury and tax evasion charges - even relatively unscathed. I keep wishing he'd decide it's time to retire. "UCD has come to represent everything that the current incarnation of the US right wing stands for, from a loss of democracy, a complete rejection of human values in favour of the corporations, right down to stylistic details like ruthlessness, intimidation, cronyism, and reliance on spin. "Could it be that, during a disastrous war [Iraq] which might be likened to Vietnam, extra precaution is being taken to ensure that nothing like the activism of that earlier time gets in the way of US strategic interests? "Are the Irish people really that fond of George W Bush that they would wish for him to reinvent Ireland's largest university in his image?" Now, let me get this straight. This man is a PhD, lectures in an Irish University (salary paid by the tax-payer) and he spouts this idiotic gibberish? And, yes, that's really what he's saying all because Erich Bloch is advising UCD on its restructuring and Bloch is also a director of the Washington Advisory Group and a member of President Bush's Council on Science and Technology. The war in Iraq's going badly so Bush needs to keep a close eye on UCD for potential unrest? Yeah, sure that's it. And, ehh, Dr. Edelman, I got this bridge that I'm thinking about selling . . .
UPDATE: I've been thinking about this and Dr. Edelman has to have been speaking tongue in cheek, doesn't he? Surely the Independent just missed that, right? I see that President Bartlett is going to spend time in Ireland now that his second term is up. I don't think it matters a whole lot, but already I've had to read/hear what Martin Sheen has to say about this or that. This is going to be really annoying. I don't deny he has the right to his opinion, but really does the opinion of a (semi-retired) actor really mean anything more than mine or any other American's here? Yet, I can just imagine how often we'll hear his voice opining on whatever American-related issue arises. David McWilliams again, this time on the rapidly aging Irish population. Over the coming few decades the most radical change in our society will be the proportion of older people. When Eamon de Valera led the 1966 Rising Commemoration, the proportion of over-65s in the population was one in 10. This figure has remained more or less static since then. In fact, the number of over-65s has only increased by 145,000 in the past 40 years. This is largely a result of mass emigration in the 1950s. These emigrants, unlike the late 1970s and 1980s bunch, never came home. Now contrast this with the next 40 years when the number of over-65s will rise nine times faster. By 2040, more than 1.3m - or one in three of us - will be over 65. Ireland will no longer be home to the "young Europeans" as the IDA ads of the past decade have trumpeted. On the contrary, far from being young, vibrant and fast-moving, we will be an old, grey and conservative population not unlike the populations of France and Italy today. I lap this stuff up, although I don't buy everything he has to say. However, I do like his take on the Italian election. Old and comfortable people don't want change. That is fundamental to what's ailing Europe right now. Like a lot of people here I don't pay that much attention to elections in EU states that are not Britain. So I may have I've missed one or two, but this week Italy became the third big EU state to have an election end in almost dead heat. Last September both Germany and Poland had elections where the margin of victory was so slight that each country was left with not much more than a political deadlock. Now Italy has joined the club. This can't be a good thing for European politics. In fact, as far as I can see the only recent winners in European politics are the French rioters. Everyone (particularly everyone in Europe) knows that Saddam never tried to buy uranium from Niger. "Bush lied" about that too. Joseph Wilson and countless others have said so. Well, someone ought to clue in Christopher Hitchens whose article in Slate requires a serious debunking effort if I'm to be convinced that he's not on to something here. "The poor you have always with you"
Well, that's a given, but I'm not sure I accept that nearly 10% of the people here are living in "consistent poverty". So long as you keep changing the definition of poverty you'll be able to show that huge numbers of people live in poverty. If I were the government minister in charge of this area I'd have dismissed the ESRI's figures as complete nonsense, but instead we have Seamus Brennan giving them some credence. "Whether we have 80,000 or 220,000 remaining in real poverty can be debated but the reality is that whatever the real numbers it is clear that there is a task that is extremely urgent and important," he said. "That is why our focus must be on targeted welfare supports and services so that real poverty, which has no place in the Ireland of the 21st century, can be finally eliminated." He must have been worried that if only the genuinely poor - no money for food, shelter, clothing - were counted that someone might suggest winding up his entire department. Or, maybe it's part of some devious plot? Is it possible that the Irish government likes to promote the idea that we have large numbers of poor people here still in order to convince our EU partners that we're not as rich as the popular press keeps saying? Check out the second of the two letters in today's Glasgow Herald. Hugh Kerr writing from Denmark says "the Celtic Tiger is a myth" and as evidence he points to the "official Irish agency to combat poverty has just produced its annual report which shows that Ireland has 25% of its children growing up in poverty". So, Hugh's off in Denmark believing what he reads about Ireland rather than what anyone here can see with their own eyes. Last night I had a call from Angela. The night before it was Leander. Two nights before that it was Frances. Last night I was in the middle of my dinner, which had the effect of making me more discourteous than I normally would like to be. Maybe tonight I'll try to ask about family and maybe try and check on my old friends Angela, Leander (I think that's what he said) and Frances. New York Assemblyman Ivan Lafayette wants to ban the New York State Department of Motor Vehicles from issuing vanity license plates that promote the Boston Red Sox. Now, I'm all in favor of hurting Boston fans, but it is a complete waste of time and a senseless loss of revenue for the state government to even consider this proposal. What would be a better idea would be to double the cost of promoting an out of state enterprise, such as the Sox (and the Giants and Jets too). To be honest, I'd never pay the extra cost to show what a great Met fan I am. The Statue of Liberty or Niagara Falls will do me fine, thanks. But, if I were living in New York State paying taxes there I'd be keen that others be coaxed into paying extra in the hope that I could save a bit. Robbing Red Sox fans sounds like an ideal place to start. Controversy erupted this week in New York when the Mets new star pitcher, Billy Wagner, entered the game to the not-so-soothing sounds of Mettalica's Enter Sandman (req. RealAudio). You see, the Yankees star relief pitcher, Mariano Rivera also enters games to that same song and Wagner's use of the same song is practically a sacrilege as far as some Yankee fans are concerned. The facts are that Wagner was using the song before Rivera ever did and that Rivera himself doesn't care. (Rivera only listens to Christian music.) On top of that, Metallica's manager is a Met fan and he seems pretty keen on Wagner using the song. Despite all that, some Yankee fans - even I have to accept that most of them are not this dumb - are outraged that Wagner would dare to enter a game to the same song as their beloved Rivera. As far as I'm concerned there's way too much noise coming over the public address systems at ball parks today. I'd be much happier if there was no music at all, but if we must have something I think Wagner should go with Immigrant Song by Led Zeppelin. The song title and lyrics don't matter anyway and Immigrant Song is far better than Enter Sandman. Plus, I well imagine that the crowd would love joining in with Robert Plant's howl. UPDATE: Thanks to Gerard for alerting me to this video version of Immigrant Song. I confess that it's possible that I don't know what the word "leak" means when we're talking about a government official, but if the President authorized Lewis "Scooter" Libby to release information to the press then is it still a "leak"? The President is authorized to classify and declassify information. There is no higher authority. The Army Corps of Engineers has pretty much accepted that the New Orleans levees failed due to a design flaw. "We have now concluded we had problems with the design of the structure," Strock told members of the subcommittee that finances corps operations. "We had hoped that wasn't the case, but we recognize it is the reality." Experts from the National Science Foundation, the external review panel for the corps, said potential problems have been known for some time. They cited a 1986 corps study that warned of just such separations in the floodwalls. But Strock told the panel that the corps was unaware of the potential hazard before Aug. 29, when Hurricane Katrina drove a massive surge of water against New Orleans' storm-protection system. He said the corps is evaluating all the levees to see whether they, too, could fail in the same way. "There may be other elements in the system designed that way that may have to be addressed," Strock said. It's almost refreshing to read of someone saying, "Yeah, we blew it". Now, some clarity regarding that 1986 study wouldn't go amiss. National Guardsman Tim Schultz was running a small businesses, working 70 hours a week and making a decent living when he left for training before going to Iraq. Before Schultz even got to Iraq, his business was suffering in his absence. By the time he returned in November 2005 his business was a lost cause. He may also lose his house, which he used as collateral for a government loan intended to help sustain his business while he was away. Schultz's attitude is admirable - he doesn't regret his deployment - but his case illustrates another aspect of what it means to serve your country. Everyone makes a sacrifice. Employees who are in the Guard have some measure of protection when they're activated, but small business owners do not. It's probably not even possible to do anything to help them as small business owners often succeed through the strength of their commitment and personality and when they're away their business inevitably suffers. Today Rudy Giuliani will ask a jury to sentence Zacarias Moussaoui to death. I don't really care what happens to Moussaoui, but I'm not sure executing him is such a good idea. Until a few days ago I paid almost no attention to Moussaoui's trial. The last few days I've been thinking about his possible execution and it strikes me as a strategic error. This is a war. Executing Moussaoui may be just, but the search for justice cannot outweigh the need to win the war. Keep him alive and use him to serve our cause. MEN are nearly twice as likely to walk away from a failing marriage as to abandon their struggling football team, research has revealed. And the divorce rate would halve overnight if men showed the same commitment to their relationships as they did to their teams, according to a study by psychologist Dr Aric Sigman.
. . . "In an age where politicians' loyalties are seen as chameleonic, where jobs and relationships come and go, loyalty is now reserved for something men feel they can actually believe in - football". What? Somebody needed to do research to learn this? You and your team is like a parent/child relationship - no matter what you still love them. Christopher Dodd is weighing his chances of winning the Presidency in 2008. If he won, would he still vacation in Roundstone, Co. Galway? Today there's a meeting between FÁS management and labor unions to try and "avert industrial action scheduled for tomorrow". Why? I think it would be a good idea for FÁS to have a strike, only it should be a long one. Say, a month or two. This would enable the public to discover whether they really need a FÁS in a booming economy or whether all those funds could be more usefully employed elsewhere. I think if I was a SIPTU negotiator I'd be keen to avoid a shut-down at all costs. If a union calls a strike and shuts down the operation but nobody notices, does it make a noise? Everyone in America now knows, but on this side of the Atlantic the story's still untold. Joakim Noah, son of Yannick of tennis fame and former Miss Sweden Cecilia Rodhe, was the best player in the NCAA tournament that ended last night. Noah led his Florida University team to the national title in front of 43,000 fans in Indianapolis. Joakim grew up in France and then New York and seems like a bright kid with a bright future in professional basketball. He also gives the impression that his unusual family life hasn't caused him any difficulties. Yannick, who always seemed to be dancing to his own beat when he was playing, was there to watch the final and, according to Mike Lupica, father and son were "hearing the music together". Today is Opening Day, the best day of the year. The Mets play Washington at 1:10 (6:10 here in Ireland). The game is live on NASN. Met fans are more hopeful about this coming season than we've been since April 2001. And, all those baseball fans in Ireland (& Britain, too, I think) who don't get NASN should be able to see some games on Setanta Sports. The games begin on Setanta with tonight's midnight start between San Francisco & San Diego. The Dermot Morgan character, Father Trendy, was "an unctuous trying-to-be-cool Roman Catholic priest". Supposedly, Fr. Trendy was based on Father Brian D'Arcy. Today's real life Father Trendy just waiting for a new Morgan to mimic is the PD's Fiona O'Malley. You just can't take her seriously. The PD's have something of an image as a "right wing" party and Fiona O'Malley is determined to ensure that she, at least, is not tarred with that brush. She manages to accomplish this by making the stupidest policy suggestions. Her latest is that condoms should zero-rated for VAT (exempt from the 21% sales tax) because, "[c]ondoms are not luxury items. To retain the 21 per cent VAT rate is unfair and frankly unsafe". Right on! Condoms are not a necessity. I know this may be unimaginable for O'Malley, but people can, if they want, live a chaste life. And, what about some other "luxuries" which are subjected to the punitive 21% VAT rate such as: detergent, dish washing liquid, toothpaste, phone lines, clothes, etc.? Not a word, but without those luxury items we'd have more serious health (and other) problems than we have thanks to the VAT on condoms. And, politically, who is she appealing to? The under 25's who don't vote anyway? Trying to make the PD's hip for young voters is no less ridiculous than all those futile efforts at making Catholicism fun for the young. Tom Tracy died on March 22. I only found out yesterday when I saw it in Chris Ryder's article in the Belfast Telegraph. Tom was extremely generous when it came to the Newshound. During the late 90's Tom provided a substantial sum, which helped build up and sustain the Newshound, and he remained a devoted subscriber. He was committed to the Newshound. He always told me the Newshound was his home page and that he couldn't do without it. This was despite the fact I always had the feeling that he had read all the Irish & British papers by 6am (10pm in California). And, it wasn't just money that Tom gave. He spent hours on the phone with me, meeting me when he was in Ireland, introducing me to other people with a view to assisting the Newshound. "What can I do to help? ", was his constant refrain. I'd like to say thank you to Tom. My prayers and sympathies are with his family. Tom's family have set up a web site where people can learn more about him and also leave a short message. Here's the obituary from the Orange County Register. Certainly it's not funny for those involved, but this story about how the Gardai have been asked to attend a creditors meeting so that they can help insure that peace and order reign does have its amusing side for those of us who are only onlookers. The creditors are meeting to sort out the mess after the collapse of The Wedding Dress, a bridal shop in Cork. The creditors are afraid of those brides who may now be without both their money and their dress. When the news of The Wedding Dress fiasco first broke a group of enraged brides-to-be stormed a wedding dress warehouse. I've heard rumors that accountants throughout the county have been urgently applying for short-notice vacation time starting Thursday - so great is the fear of these women. It's clear the Taoiseach made a mistake last Saturday night. Instead of putting his watch one hour forward, he moved it a full day ahead. What evidence do I have for this claim? Yesterday he requested that the public and, especially the media, have a "less negative attitude towards banks, particularly towards the levels of profit they earn". What a sense of humor the man has. Only, it's just a shame that he got his dates wrong. I don't care what the research says, I sincerely doubt that children "do better at school if their mothers wait until their mid to late 20s before starting their families". I hope what's going on here is that this is an error by the journalist and not an indication of the quality of the research or report involved. The way this first sentence from the Times's article is written you'd be inclined to think that if a woman has her children while she's in her early 20s the child will underperform in school. What I suspect is really going on is that, on average, women who are having children at 22 (or whatever) are less "educationally oriented" than those who are having children at 28. "It's my speculation that women who start their families in their early 20s are not seen as a risk group by society," she told the British Psychological Society meeting in Cardiff. I just do not believe that a child born to a 22-year-old woman in a stable marriage would be any better off if she had simply waited 5 years. Oh, wait a second, maybe this is one of those April fool's articles? If yes, it's not that funny.